Payment for professional services is due at the time dental treatment is provided. We accept cash, personal checks, debit cards and most major credit cards. A treatment plan and an estimation of the portion insurance will cover and the portion you will be responsible for will be provided to you prior to the start of treatment. Once you've agreed to the treatment we propose and upon completion of the work, we will submit the claims to your insurance carrier. Dental insurance benefits differ greatly from traditional medical health-insurance benefits and can vary quite a bit from plan to plan. Where medical insurance was designed with the intent of covering the majority of costs, dental insurance was designed as a supplemental aid to the individual's costs. It is important to remember that dental insurance is never a pay all. Dental insurance is a contract between your employer and a dental insurance company. The benefits you receive are based on the terms of the contract that was negotiated between your employer and the dental insurance company. 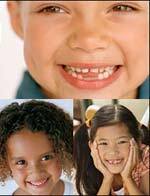 At times, the benefits negotiated do not coincide with the dental needs of your child. Also, deductibles, percentages and co-payments must be considered when estimating dental benefits. Any questions regarding financial or insurance questions, feel free to contact our office and speak with Sandra.